I hate to criticize movies. That may seem like an odd statement coming from someone who writes a blog built on film criticism, but it stems from personal experience. I spent a few years in my mid-twenties making independent films. On one of them, I was the writer, director, editor, producer, and lead actor. In short, I learned just how difficult it is to make a good film, and I can only imagine how much harder it must be when dealing with a multimillion dollar budget, dozens of locations, special effects, studio pressure, and a huge cast of actors. So I hate to criticize any film because I know of all the hard work that went into making them – and that luck plays a major factor in any film’s success. Having said that, “Branded,” which opened nationwide on Friday, is one of the worst movies I have ever seen. The only pleasure the film provided came in the moments when I was laughing out loud at its implausible characters, hackneyed dialogue, and utterly baffling plot twists. It feels very much like a first screenplay – not a screenwriter’s first produced work but instead the kind of movie that a fourteen-year-old writes in his basement just to see if he can write a movie. What makes “Branded” such a painful experience – and one of the reasons it fails – is that it tries so hard to say something important. It aims to explore the pervasive and destructive influence of corporate marketing on our society and our personal happiness – a worthy topic. But the movie’s central failure is that it does not dramatize this idea. It merely presents it – in dialogue and some very odd special effects – and then surrounds it with one of the oddest, illogical plots I have ever seen. It may be impossible to actually explain the story, but damn if it isn’t my job to try. 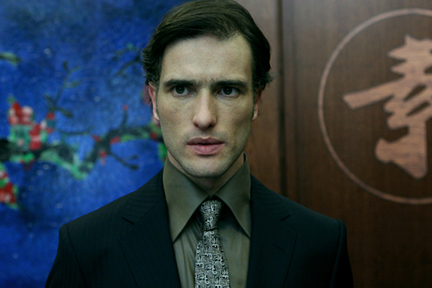 Ed Stoppard (son of playwright Tom Stoppard) plays Misha, a British-born, Russian-raised marketing executive in Moscow. Misha is a smart and likeable young fellow, although his character is never specific enough to be sympathetic. After getting passed over for a promotion, he quits his job and starts dating the boss’s daughter (Leelee Sobieski), while working with her on a new Russian version of “Extreme Makeover” that will culminate in an overweight young girl receiving massive amounts of free plastic surgery to become the new “It Girl.” Meanwhile, a powerful cadre of fast food companies has hired the world’s greatest marketing mind (Max Von Sydow) to make make it cool to be fat, which he accomplishes by forcing the show’s star into a life-threatening coma. Supposedly, the world sees this poor girl laying comatose and decides that being thin is not worth the cost, at which point they will all start buying a lot of fast food. How do we know that Von Sydow’s character is the world’s greatest marketer? We are told so, in sloppily-written voice-over. Screenwriting teachers will tell you that voice-over narration is a weak storytelling tool. It is often used to cover up poor writing and that it violates the first commandment of writing – show, don’t tell. But voice-over can be effective if it does more than present exposition (“Fight Club,” with its unreliable Narrator, is a good example). Here, those screenwriting teachers are absolutely correct. The voice-over, spoken by a woman whom we never meet in the film, serves only to connect the dots between what would otherwise be an absolutely undecipherable plot. It is also worth stopping here to point out that the entire plot rests on a fallacy. Making people think it’s cool to be fat will increase fast food profits? Doubtful. As a society, we are as obsessed with being thin as we have ever been, yet our national obesity rate continues to rise every year. But “Branded” is not interested in the complexity of reality – only the logic needed to advance their ideas. So Misha, not knowing that a corporate conspiracy is behind his show’s failure, leaves Moscow, moves to the country, and starts hanging out with cows. One night, he has a dream, in which he is instructed to perform an ancient ritual. One of his cows turns red, so he slaughters it, burns the cow’s carcass, then bathes in its blood and ashes. Sure. Who hasn’t done that? When he awakes and returns to Moscow, he discovers he has an incredible power: to see physical manifestations of people’s corporate impulse to buy. It looks kind of like an amorphous, psychedelic goblin coming out of a person’s back. The bigger it gets, the stronger the impulse. When you satisfy your craving, by, for example, buying a burger at your local fast food restaurant, the goblin shrinks and disappears for the time being. It’s hard to guess what tone the filmmakers behind “Branded” were aiming for, but I can only hope it wasn’t this one. If they were aiming for satire, it would have been nice to include a few attempts at humor. It is more likely that they were going for the kind of super-serious, psychedelic, didactic idea that seems really brilliant when you’re stoned at two o’clock in the morning – but you think better of in the cold, unforgiving light of day. I only wish that the “creative” team behind this stinker had spent a little more time in the daylight. It’s too bad because there was a kernel of a good idea in “Branded.” The idea of corporations using more than the power of suggestion to influence our purchasing choices is intriguing. It’s why I went to see the movie, despite the warning signs – the film had no stars, no early reviews, and, ironically, no marketing campaign. But the filmmakers failed to adhere to one of the first rules of serious filmmaking – the message must spring forth organically from the characters and the story, not the other way around. In “Branded,” the characters seem like mere nuisances to a young filmmaking team who knew they had something important to say – and stopped there.